Former Lions forward Stephen Ferris says securing a home semi-final in the Pro12 play-offs is vital to Ulster's chances of winning the competition. The Irish province face an uphill struggle to make that a reality as a draw with Munster in Belfast on Saturday left them fourth in the table. "If they get a home semi-final I believe Ulster can reach the final and win the tournament," said Ferris. "If they end up with an away tie in the last four it will be very difficult." Neil Doak's side trail Ospreys, Glasgow and Munster by one point going into the final round of fixtures, with a testing trip to the second-placed Scottish side to come on Saturday. "All the lads will go over to Glasgow with confidence. Every single player in that dressing room will believe they can go there and win," added the ex-Ireland and Ulster back-rower. 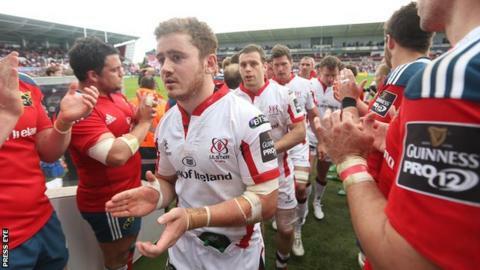 "Ulster got out of jail against Munster and they need to be a little bit smarter in certain situations. At this level you have to take your chances and hopefully they will do that against Glasgow. "It promises to be a good game as Glasgow also like to get the ball out wide to their fast men and Tommy Seymour is doing a great job for them. "Neil Doak may have a few tough decisions to make for next week but I think he will ultimately stick with much the same team he fielded against Munster, depending on injuries and a possible suspension for Iain Henderson. "Darren Cave didn't do much wrong and engineered a great line break in the second half, then Stuart McCloskey comes on and offers the team a totally different dimension. He's a great player to have coming off the bench, while Jared Payne is so solid." Ferris praised fly-half Paddy Jackson for an "immense" performance against Munster, but believes his half-back partner Ruan Pienaar was unusually below-par in the keenly contested interprovincial derby. "When Paddy nailed that conversion to earn a draw in the final minute I'm sure it gave Ireland coach Joe Schmidt, watching from the stand, something to think about. "Ruan is our 'Rolls Royce' player and everything he does is usually on the money, but he just wasn't quite there against Munster. "Being the class player that he is, I would back him all the way to bounce back next week and put in a great shift."